Amy Benjamin’s landmark analysis “The Many Faces of Secrecy” was published in the William & Mary Policy Review in October 2017. It addresses the “systemic secrecy crisis” in the United States. Benjamin is a lecturer at the Auckland University of Technology and is a former attorney at the US Department of Justice. “Political secrecy in the United States has never been more studied – and less understood – than it is today. This irony is due in large part to the slippery nature of the phenomenon: Secrecy presents in different guises depending on the area of governmental activity under consideration. In the classified world of the U.S. national security state, secrecy results from affirmative governmental acts designed to enforce a sharp distinction between official and public knowledge. In the outsourced and technocratic worlds of governmental contracting and economic management, secrecy results from quiet acts of exemption of whole areas of decision-making from the normal processes of public scrutiny. Scholars have underestimated the magnitude of the political secrecy that besets American society, and misconceived prescriptions meant to manage it, because they have failed to recognize that they are dealing with the same challenge in different form across multiple disciplines. ~Benjamin, Amy, The Many Faces of Secrecy (September 18, 2017). William & Mary Policy Review, Vol. 8.2 (2017) . Available at SSRN. 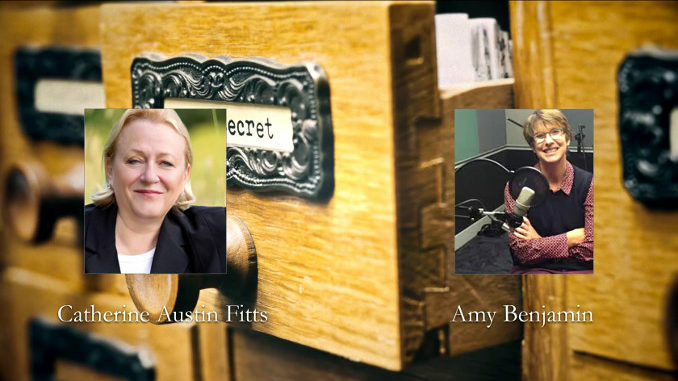 While I was in Auckland, I had the opportunity to interview Amy for the Solari Report. We discussed her concepts of direct and indirect secrecy and explored in detail how indirect secrecy is engineered so as to make it difficult, if not impossible, for the general population to understand what is happening around us — in the government, in the economy and the financial markets. Indirect secrecy includes (i) monetary and fiscal policy (making sure you do not have accessible central bank and government financial disclosure so you can understand “how the money works”), (ii) outsourcing government operations and intelligence to private corporations and (iii) engineering secret agreements and transactions through international institutions. It is a challenge to understand how so much is kept secret. Once you understand the mechanics and infrastructure, however, that engineers this growing divide between “official reality” and reality, the world we are living in today starts to make a lot more sense. We explore how to return transparency to our governments and public discourse. We will publish this fascinating discussion for you this coming Thursday. In next week’s Let’s Go to the Movies I will comment on Bill Arkin’s excellent database development for the series he co-authored Top Secret America described here in his 2011 interview on Democracy Now. Unfortunately, this searchable data has recently been taken off line. It is the last week of the month so there is no Money & Markets. I will be flying from New Zealand to San Francisco. If you are in the Bay Area I hope to see you for our tea on the afternoon of June 2. Subscribers can sign up here.